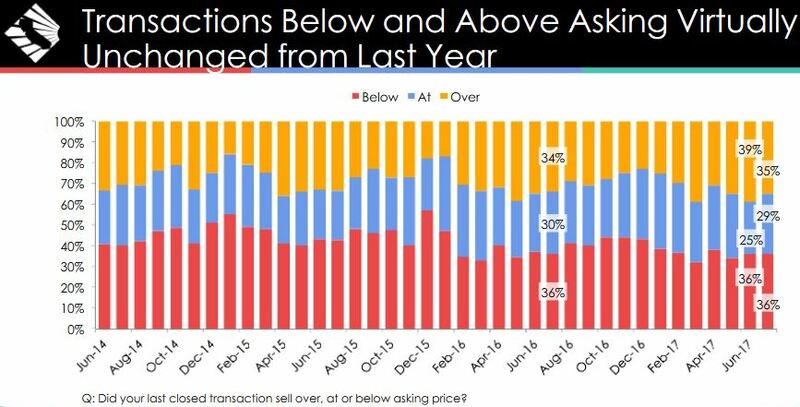 The percentage of properties selling below asking price remained flat from last year at 36%. The percentage of properties selling above asking price increased from 34% last year to 35%. 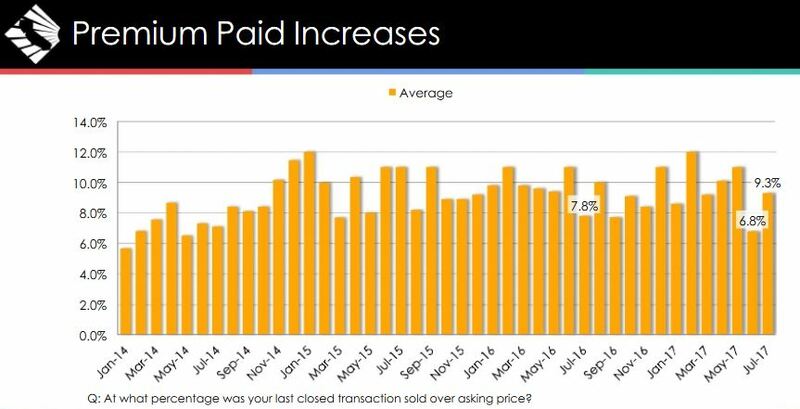 The percentage of properties selling at asking price increased to 29%. Fannie interviews 1,000 people every month, and then leaves it up to their ivory-tower guy to explain it to the masses. 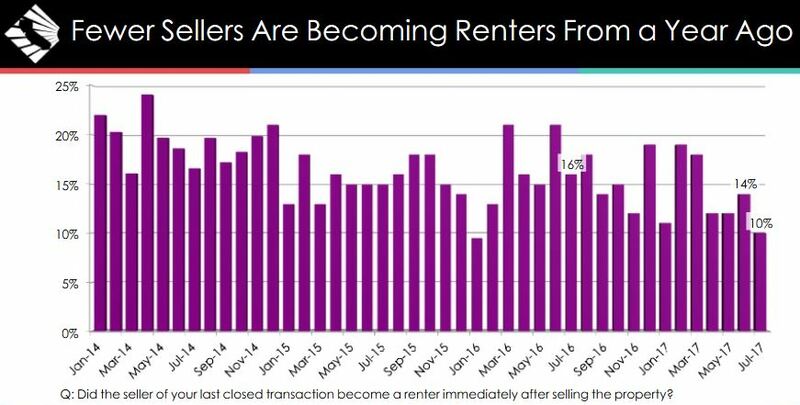 Here’s my conclusion from my own personal survey: buyers are being cautious due to prices going up so fast. Consumer attitudes toward housing appear to have stalled somewhat amid a recent dip in confidence regarding personal finances and income growth, according to results from Fannie Mae’s March 2015 National Housing Survey™. Among those surveyed, the share who expect their personal financial situation to improve over the next year fell to 41 percent last month, while those who said their household income is significantly higher than it was 12 months ago fell to 22 percent. Additionally, the share of respondents who said they would buy a home if they were to move decreased 5 percentage points to 60 percent – a new all-time survey low. 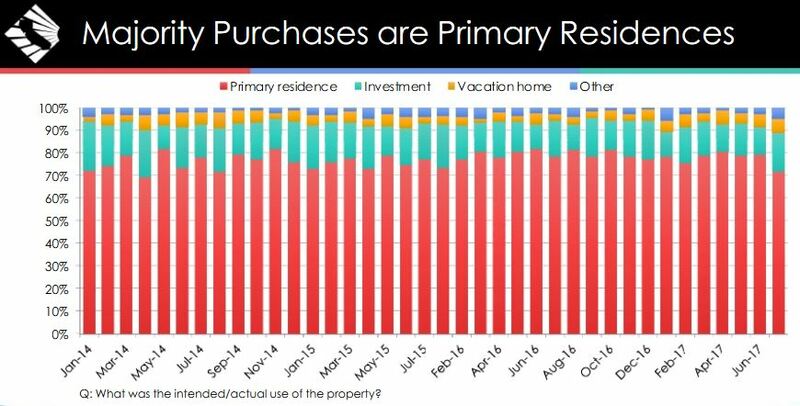 On the bright side, the share of consumers who believe now is a good time to sell a home reached a new survey high of 46 percent, narrowing the gap with those reporting it is a good time to buy, perhaps signaling a more balanced housing market. The survey found 85 percent of buyers used a mobile device during the home buying process, with the majority of buyers (70 percent) accessing the Internet from their smart phones and 15 percent accessing it from their tablets. 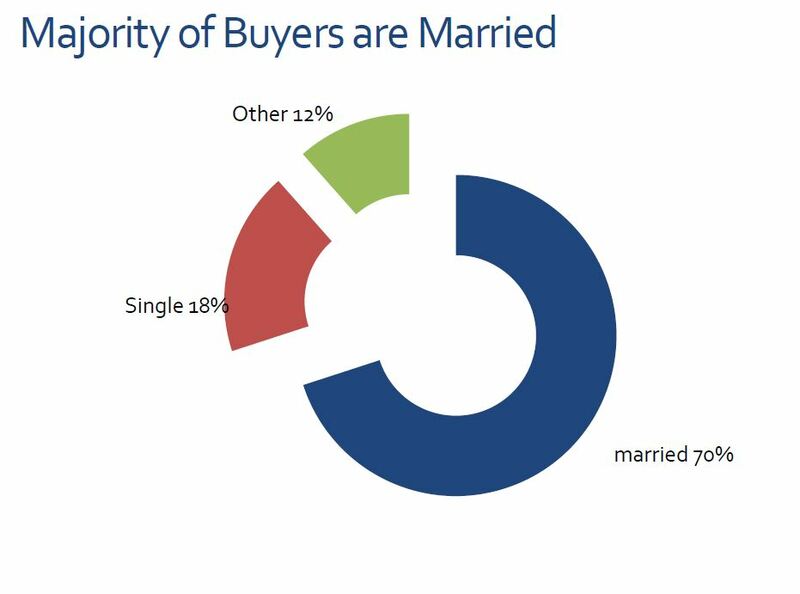 While the majority of buyers (61 percent) found their home through an agent, the percentage who found their home online more than doubled from 16 percent in 2012 to a record high of 37 percent in 2013. 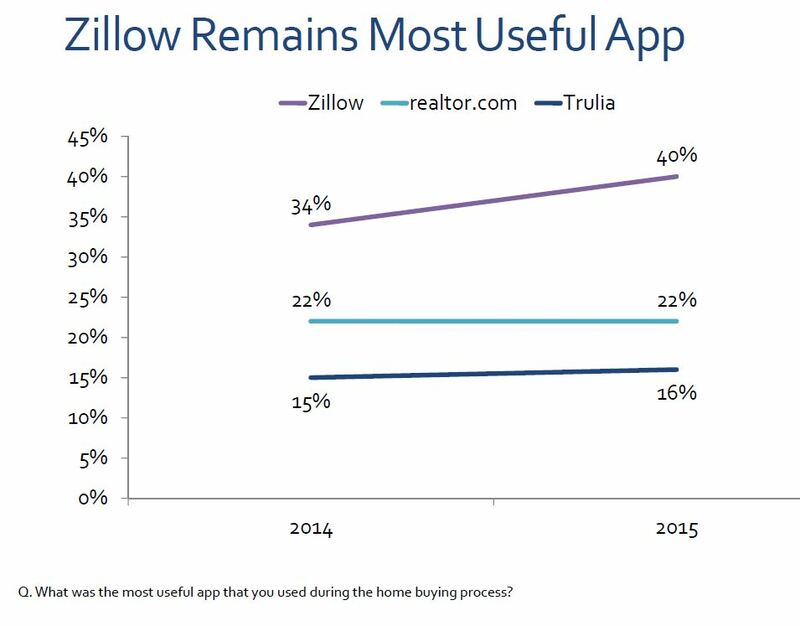 Almost one-third (30 percent) of buyers rated Realtor.com as the most useful website, followed closely by Zillow at 28 percent. Broker and agent websites were also helpful in the home buying process as buyers increasingly seek local expertise and information. The use of social media in the home buying process continued to increase, with three-quarters of buyers now using it, compared to 52 percent who used social media in 2011. Buyers primarily used social media for buying tips and suggestions from friends (43 percent), neighborhood information (42 percent), and to view their agents’ Facebook pages (41 percent). The use of social media as a form of communication is expected to grow, with 91 percent of buyers saying they are receptive to receiving information about the home buying process from their agent via social media. The survey also found that buyers spent nearly six months considering a purchase before contacting an agent, nearly twice as long as last year. They took more time investigating homes and neighborhoods before contacting an agent, spending just over seven months on researching, compared to about 1.5 months last year. 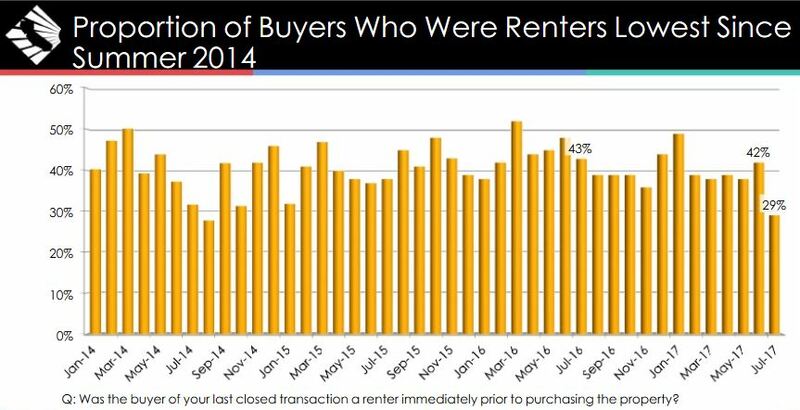 Additionally, buyers spent nearly 10 weeks looking for a home with their agent, a week longer than last year. More than eight out of 10 buyers (85 percent) made offers on other homes, and one-third said they settled for the best option given the limited supply of houses. 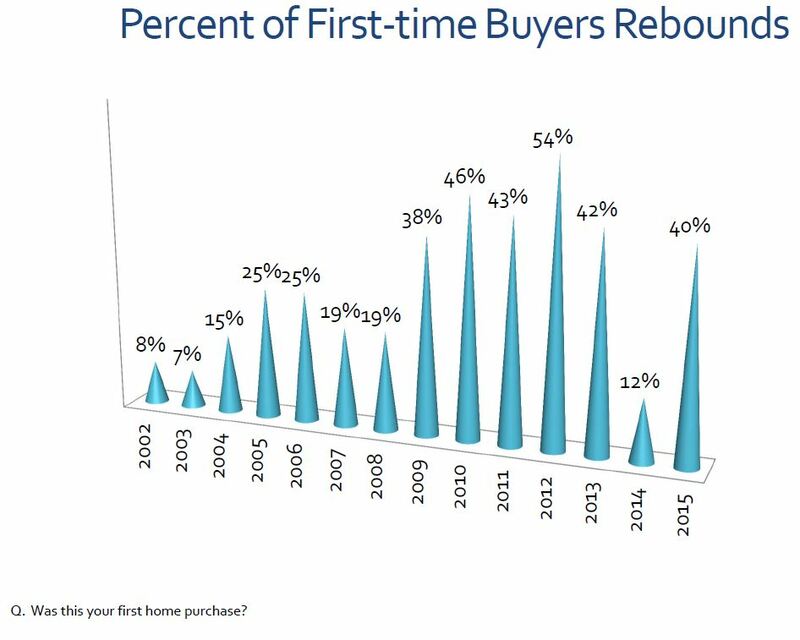 • Buyer optimism about the future direction of home prices continued to grow, with the majority of buyers (60 percent) believing prices will go up in five years and 36 percent seeing prices rise in one year, up from 41 percent and 25 percent, respectively, last year. • Buyers cited price decreases (38 percent), favorable prices/financing (12 percent), and the desire for a better location (10 percent) as top reasons for purchasing a home. • Reflecting the prevalence of tight lending standards, buyers experienced extreme challenges in obtaining financing. On a scale of one to 10, with 10 being extremely difficult, buyers rated their difficulty in obtaining financing at 8.6 on average, the highest in the survey’s history. • Higher down payments are the market norm these days, with buyers putting an average of 25 percent down on their home purchase. 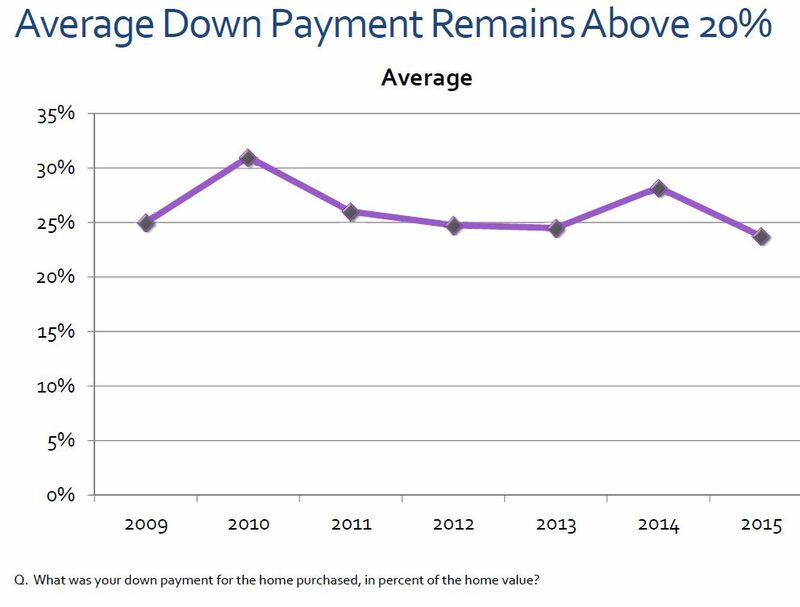 The average down payment has been greater than the traditional 20 percent since 2009. • Ninety-one percent of buyers obtained a fixed-rate loan, up from 84 percent in 2011, reflecting low rates and the desire for certainty as the market gets back to basics. 1. Is Now a Good Time to Buy or Sell in Your Area? A. It is a great time to sell, as long as you can live with today’s prices. Sure, potential sellers can believe that it’s better to wait until prices go significantly higher, but that may not happen when you want it or need it, and it may never happen. B. It is a terrible time to be a casual buyer. Only those who buckle down and commit to seeing every new listing within the first day or two, and are willing to pay all the money for the quality buys will succeed. Another big challenge is finding an agent who can win bidding wars. 2. Do You Expect Prices to Generally Rise or Fall in the Next Year? A. I expect that general pricing will rise 5% statistically, and be hampered by inventory shortages, arrogant listing agents, and short-sale fraud. All three are contributing to a pricing limitations, and only the first has a chance of changing. If a surge of well-priced quality homes were to hit the open market, they would be gobbled up quickly – and the resulting momentum could take prices significantly higher if the flow of new listings continued. 3. 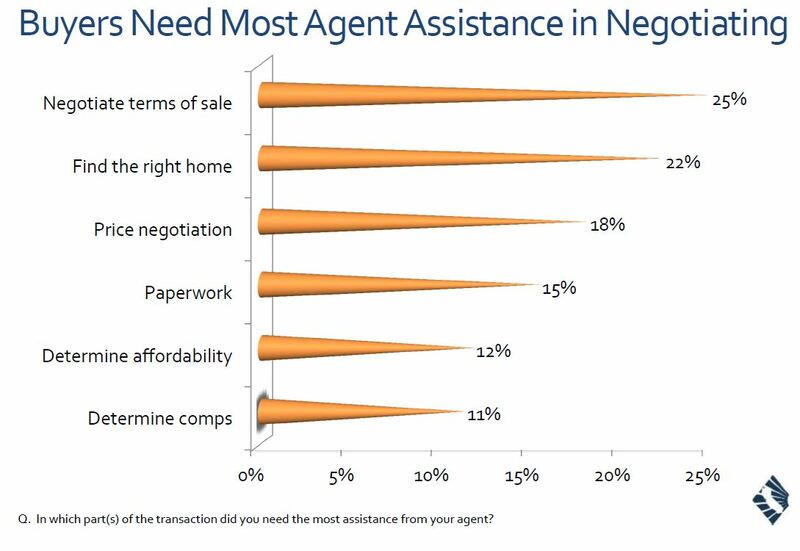 What are the Most Common Challenges for Buyers in Your Market? A. Having a clean shot to purchase a property. The time is ripe to convert to an open auction-type format to sell properties, so buyers can at least see with their own eyes what is happening. The games being played by listing agents are impeding open bidding and market-value pricing. 4. What are the Most Common Challenges for Sellers in Your Market? A. Shopping for listing agents based on who will quote you the highest price, and ignoring how educated the buyers are about market values. 5. 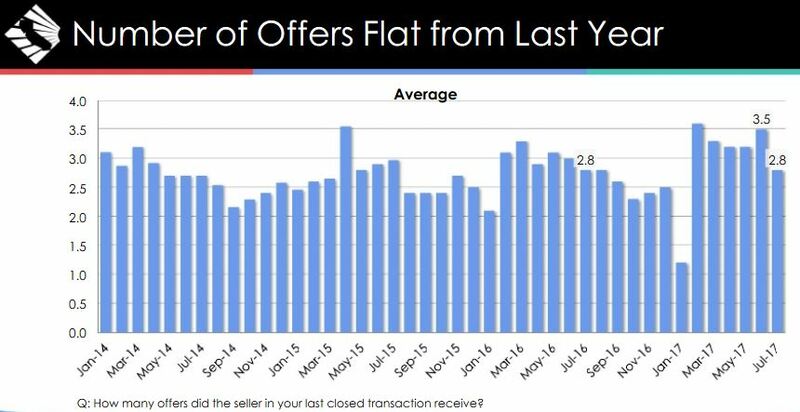 Are Buyers and Sellers are Getting More Confident and Aggressive? A. Absolutely, and they are more aggressive than the agents, who, as a result, are being left behind. 6. The Real Estate “Profession” Over the Next Five Years? A. 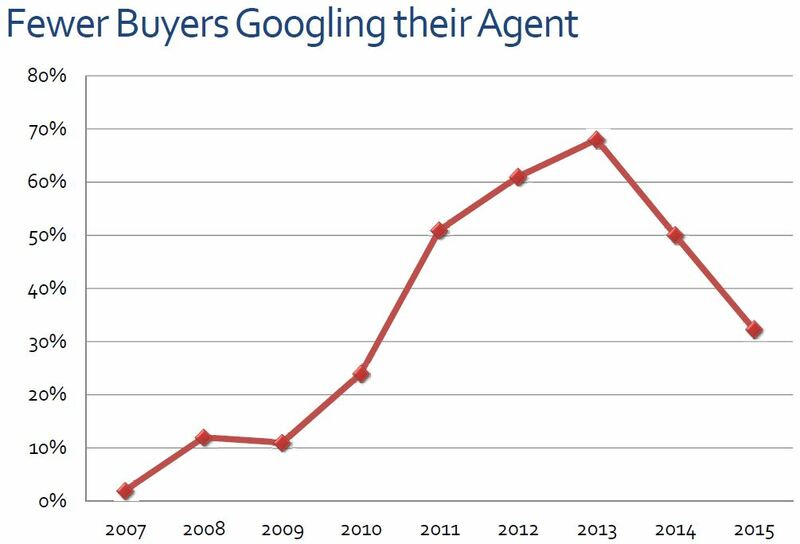 The agent population should decline significantly, but there will always be licensees sitting around with business cards and a facebook account hoping that something will fall in their lap. We are way overdue for a significant game-changer to shake up the industry (public-MLS), and it should set off a commission war. Wrap-up: Those who play nice will undoubtly feel better next year, as long as rates stay ultra-low, but nicey-nice agents only get the leftovers. For those who are on the streets battling it out every day, the fight will be more competitive than ever. Are feeling the pinch of low inventory and multiple offers: 90% of agents indicated that low inventory was one of the most common challenges facing buyers, and 91% pointed to multiple offers. Are seeing both buyers and sellers gaining confidence in the market: 85% of agents agreed that buyers are becoming more confident about the market, and 84% agreed that sellers are becoming more confident. Have hope for future of the real estate profession: 59% of agents believe that the real estate profession will grow in size in the next five years, 30% believe it will remain the same, and just 11% see more declines in the future. The picture painted by the agents is one of cautious optimism. Most agents we surveyed expect modest price gains, improvements for buyers as well as sellers, and moderate growth in the real estate industry. The results line up nicely with recent gains in overall consumer confidence, which has been rising steadily through the year. No V-shaped recovery appears imminent, but rather a slow and steady trend back toward something resembling a normal market. An overwhelming 85% of Americans prefer homeownership over renting, Fannie Mae said in a new study. However, while this remains the prevalent attitude, economic realities still keep many from actualizing this dream. Demographics such as income, age, marital status and employment status are still considered significant drivers in the decision of buying a home or renting, Fannie found that beliefs about housing help determine whether Americans intend to rent or buy their next residence. “The whole world thinks about underwriting or what’s my income (when evaluating the homebuying decision), but what is driving consumers seems to fall more in this attitudinal world,” said Steve Deggendorf, one of the authors of the study. “People are thinking about this process (of buying a home) as being very deliberate, but with most people it is complex.” He even describes it as emotional, and in most cases, employing a series of subjective and objective beliefs on the consumer’s part. Fannie produced the national housing survey based on feedback from 12,014 interviews that occurred in 2011. When looking at feedback from Americans who already have a mortgage, 40% cited attitudes about finances—such as the ease of getting a mortgage, affordability, homeownership benefits and financial stressors—as drivers that will shape whether they buy or rent their next property. About 39% of homeowners in the same group cite attitudes about housing as influencing their next move, while 21% say demographics such as income, age, marital status, employment, race or urbanicity will be primary drivers of their next decision. The key drivers of homeownership change when analyzing the responses of Americans who are currently renters. With this group, the majority — or 42% — suggest attitudes about housing such as whether renting or owning makes more sense, flexibility, good or bad market timing, negative experiences and underwater status — are driving whether they rent or own their next residence. Thirty-three percent of current renters say demographics like employment, age, income and marital status also are important homeownership drivers, while only 25% cite financial attitudes as having an impact on their next housing decision. Sixty-five percent of homeowners who own their homes outright are driven by demographic considerations such as employment, income and age. Only 17% of these homeowners cite their attitudes toward housing as a driver behind their housing decisions, while only 19% consider financial concerns as the main driver. 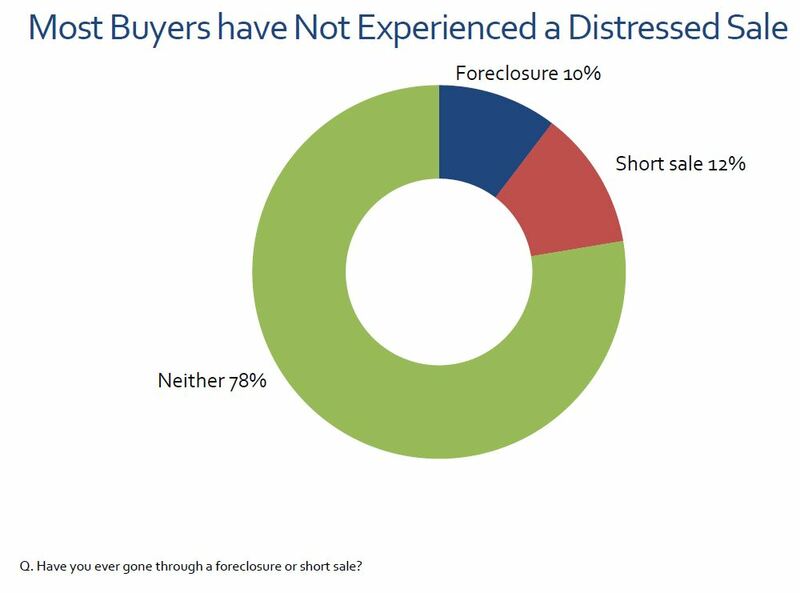 Even in the wake of a financial crisis with many homeowners underwater, the number of survey respondents who cite the negative financial effects of the housing crash as key drivers of their next housing decision is minimal, according to Fannie’s research team. What’s keeping homeownership alive is the fact that it’s not a stock or bond, but something desirable for individuals and families to live in even without a significant return on investment. “The nonfinancial benefits that people derive from the consumption of housing mitigate the negative financial experiences that many homeowners have had,” said Deggendorf. 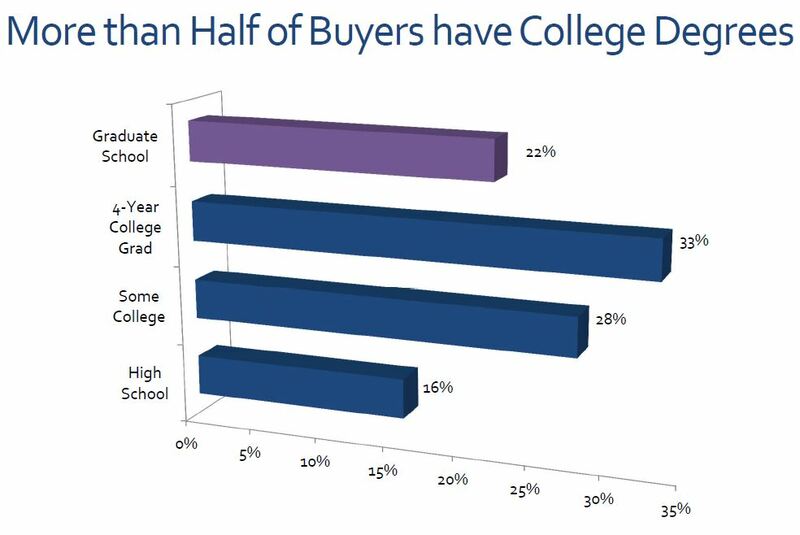 Still, Deggendorf and Huang believe the report suggests real estate professionals need to address the underlying attitudes that drive homebuyer decisions. “If we helped people understand these attitudes that are driving their decision-making process, it would help them make better housing decisions,” he said. Rather than just having consumers chase the home they dream about, a more conscious, direct approach would be to help them balance their wants against what they can afford, Deggendorf and Huang said. The research team says it’s important to educate and inform potential homebuyers since many of them may be ignoring their ability to safely buy a home, while others are potentially overbuying by listening more to their emotional desires. Fannie’s research team believes prudential regulators also should be informed of the attitudes shaping homeownership to ensure any steps they take are in line with the consumer population. 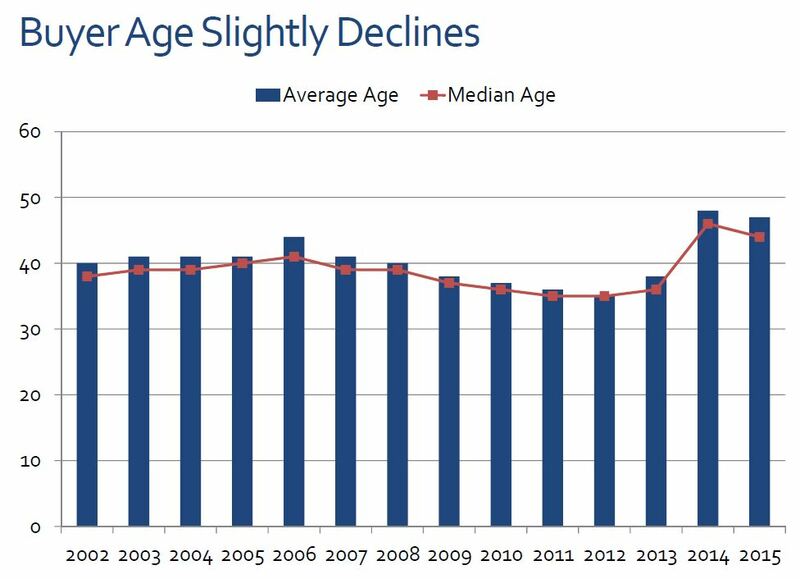 The good news is homeownership as a goal for Americans hasn’t changed in the past six years. We’re up to 292 responses to last week’s survey, thank you readers! I know prices are never going to be as low as I would like because of demand and bank and government collusion but I would appreciate it if Jim could focus more on properties that don’t require someone to make 250K+ a year. As a first time home buyer I would love to see more videos showing some glimmer of hope for being able to afford a home. I’ll make an effort to include a wider range of price-points. For those looking to spend less than $400,000, the need to compromise is very demanding. Consider these three: buying a fixer, going further out, or living with something smaller, possibly a condo. The chance of you finding a decent house, in a decent area, under $400,000 around North County Coastal is remote, at best. Could there be further market deterioration in the future? Yes, and it would likely be a result of squishdown from above. Bubbleinfo.com will help you see any potential erosion in the mid-to-upper-end market that could benefit those below. I remarked in the last radio show that I don’t have much of a feel for the audience, given the anonymous nature of blogging and the internet. I am fine with it being anonymous, I don’t need to know who you are – but I’d like to get more input about what you want from bubbleinfo.com. The previous survey asked for comments in general – this one has multiple-choice questions. Thanks for participating, I appreciate you being here! I am gearing up for a better bubbleinfo.com experience in 2012, and could use your help! How would you like to see this blog improve? What topics need more coverage? More regional posts, or keep it local? More stories from the field? More videos, or less? Too many posts? More statistics? Reader Forums? Q&As? What would you like to learn the most about in 2012? Is a mobile app needed? Utilize other internet tools, graphics, etc.? Too fast or slow? Too grumpy or sarcastic? Need more light-hearted fun? The Blog Talk Radio program is starting in January. What else – Seminars? Parties? Do you want to connect to other readers? Are you here because you are buying and/or selling? Are you considering using Jim the Realtor to help you? What would convince you that I’m the best agent for you? What Frustrates You about Bubbleinfo? What is Best About It? I appreciate your loyal readership and participation – leave any comments to help us all get more out of this experience. Thank you, and happy holidays!